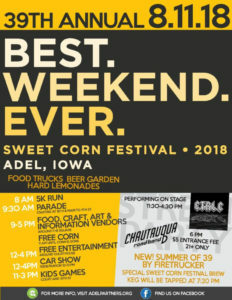 The 39th annual Adel Sweet Corn Festival begins tomorrow, and the Adel Partners Chamber of Commerce promises it will be a fun time from morning to night. The festivities begin bright and early with the 5K fun run at 8 a.m. The Sweet Corn Parade will start at 9:30, travelling down Main Street between 18th and 11th streets. Organizers say it’s the biggest parade Dallas County has to offer. Following the parade, the activities downtown will begin, which includes a car show, vendors, and free games and rides for kids. The free sweet corn, which Chamber President Marc Riley says is the reason most people are there, will be served starting at 11 a.m. until all 15,000 ears are gone. Additionally, there will be a concert featuring Ctrl C at the Stage and Pavilion from 11:30 a.m. – 4:30 p.m. The beer will be tapped at 7:30 p.m., and there will be a $5 cover fee to enter the beer garden. All other activities throughout the day are free. The Raccoon Valley Radio Big Red Radio will also be in attendance at the Festival, broadcasting live, playing music, and providing public address announcements. 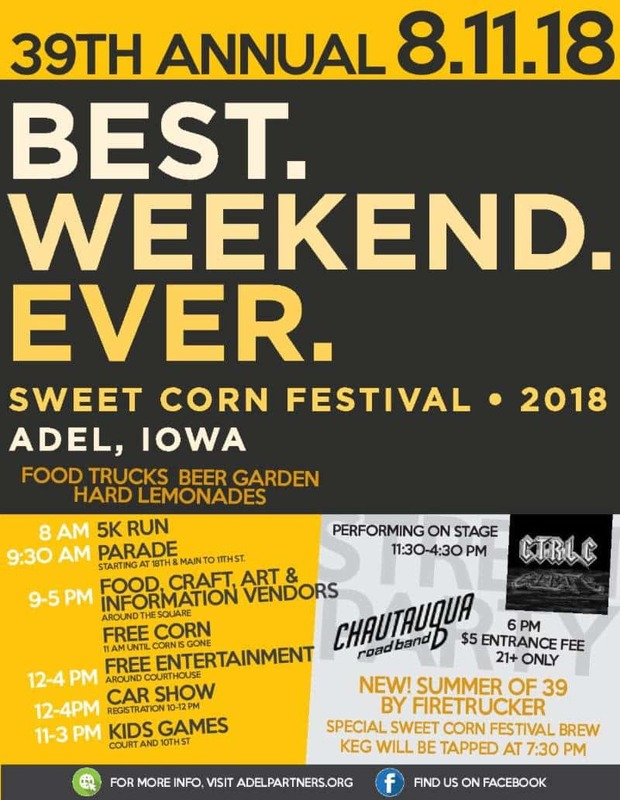 For more information on the 2018 Adel Sweet Corn Festival, click the first link below to visit their Facebook page. Click the second link to listen to the Perry Fareway Let’s Talk Dallas County program with Festival Committee member Macinzie McFarland.